Rubber expansion bellows can be used for both suction and delivery (discharge) due to its excellent stability and pressure capacity. Rubber Expansion Joints are generally used as connectors between vessels operating at widely different temperatures ranging up to 115°C. The sizes range from 32 mm to 500 mm including a wide variety of different flanges and materials. Most common available materials are; EPDM ,Neoprene, Buna/Nitrile, Hypalon, Butyl and natural rubber. Rubber expansion joints are generally used in heating and air conditioning systems, marine environments, sewage plants, industrial systems and for mild chemicals and oils. Rubber expansion joints permit the necessary motion and flexibility in a ‘working’ ship’s piping system. The compactness, resilience and low stress features make them ideally suited for shipboard piping systems. 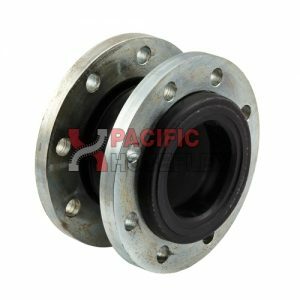 Sewage treatment plants, water treatment plants and air scrubber systems all employ the use of general rubber expansion joints. Sludge pumps, raw and secondary sewage lines, centrifugal air blowers and scrub stacks use expansion joints due to their resistance to abrasion and corrosion, as well as their flexibility, making them well suited for these applications. Nuclear and fossil fuel plants use rubber expansion joints to compensate for thermal expansion and contraction on condense lines, steam turbine exhaust lines, condensate lines, cooling water lines and aeration systems. They have been also successfully installed in demanding industrial ducting systems where flutter, heavy vibration, wet or dry corrosive materials are encountered. Rubber expansion joints reduce noise and vibration caused by forces in pumps or centrifuges by acting as a shock absorber in systems. Thermal movement is also an important consideration in a piping system. Depending on the temperature change and length of pipe, thermal movement can easily be great enough to exceed the allowable pipe stress. Rubber expansion joints are designed to alleviate piping stress, absorb pipe misalignment, compression and extension, noise and vibration, in a relatively short space. Standard stock items are the single arch and the twin-sphere joints. 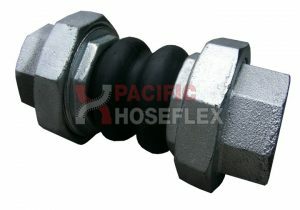 The spherical shape arch of the connector and excellent original structural design contribute to the great success of the joint. Combined with its internally laid tough flexible fibres and its moulding technique, rubber expansion joints have great ability to withstand the force of a creating vacuum. Internal reinforced rings can be inserted to increase the suction capabilities of the bellows.